What better way to open your heart this Valentine’s Day than by welcoming a new pet into your home? The dogs (and cats!) from Orphans of the Storm® are all eagerly awaiting their new loving families. I only have two new pooches to introduce this week (the other two I walked have already been adopted, hurray! ), but there are currently 97 dogs listed on the Orphans of the Storm® website, and all of them are in need of a good home! 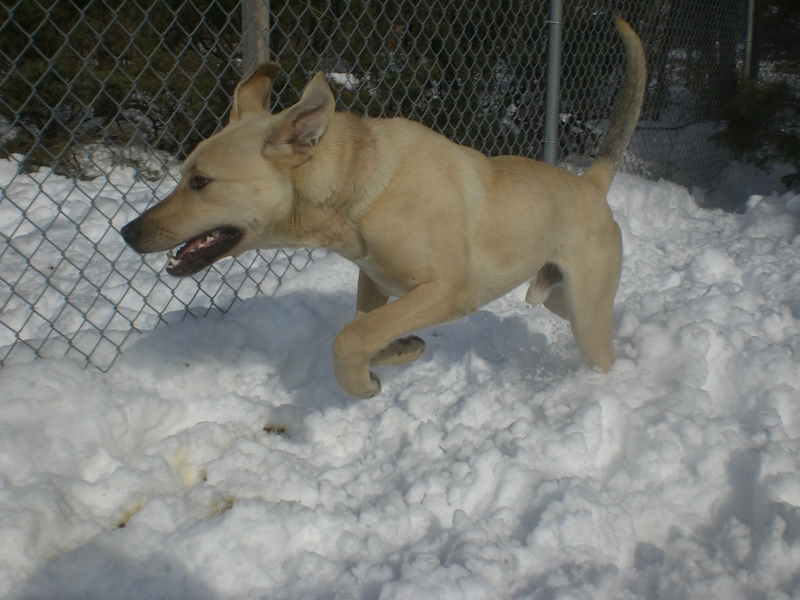 John Boy the two-year-old Yellow Labrador Retriever mix caught my eye right away as I was walking through the shelter because he seemed like such a happy boy–and he absolutely is! He was just wriggling with excitement when it was time to put his leash on. Even though he was very enthusiastic, he still did a good job of walking on the leash without pulling too much. John Boy is a very playful pooch. There was another smaller dog in the run next to us, and that dog and John Boy had the best time racing each other. John Boy would go flying through the air, and then stop and stick his nose through the fence to say hi to the other dog and wag his tail. John Boy seems like the type who would get along with everybody, as Labs are known to do. If you’re looking for a fun new friend to join the family, don’t delay–come in soon to see if John Boy is the one for you! Cooper the two-year-old Staffordshire Bull Terrier mix sadly lost his home because his family could no longer keep him. What that means for his future owners, though, is that he has a lifetime of experience being a pet! Cooper (which is an excellent name, if I may say so myself) is a strong boy, but he’s still a pretty good leash-walking buddy. A big boy like Cooper would definitely appreciate a few good walks a day and/or a nice yard to romp in. Cooper had such a fun time playing in the snow. 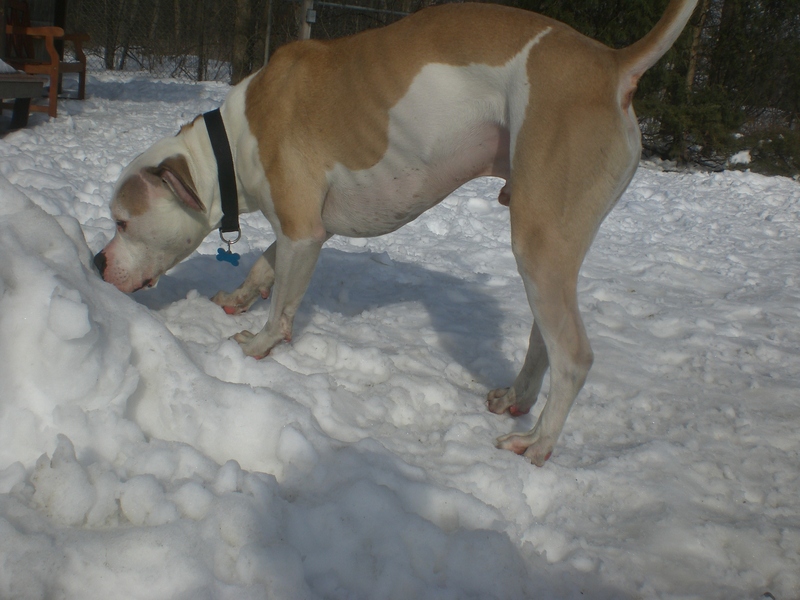 He’d sniff, dig, run, and he even attempted to fetch a snowball! Cooper seems to be okay around some dogs and less okay around others, so you’ll want to take it slow if there are other dogs in your neighborhood (which is true for all dogs, really, since you never know how two will respond to each other). Cooper enjoyed a good scratch on the back and behind the ears. He knows that he can be an excellent companion–give him a chance to let him show you! Stop by the shelter soon to meet Cooper. 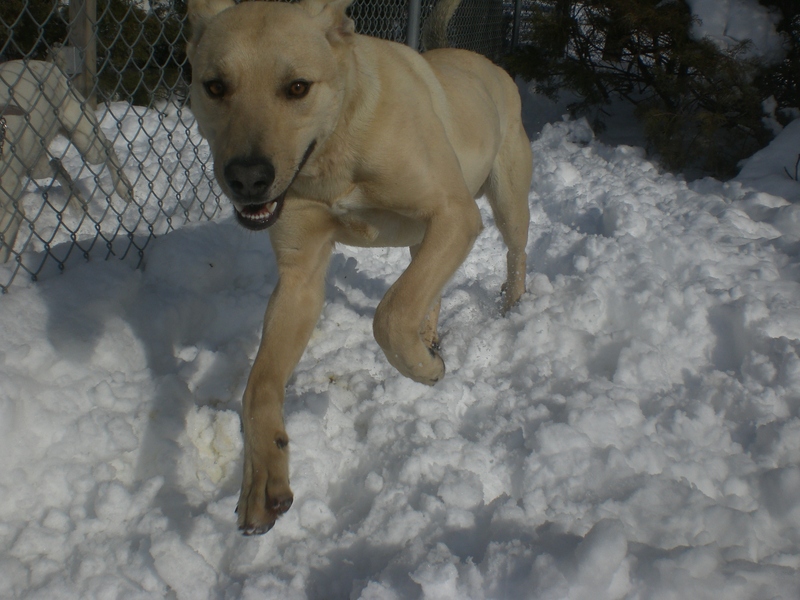 I also saw my buddies Blush (who absolutely loves snow and will happily stick her entire face in a snow pile), Cosmo (who is thankfully getting a little less nervous each time I walk him), and Topaz (who is quite possibly the most affectionate dog at the shelter right now). Which pooch will be your Valentine this year? 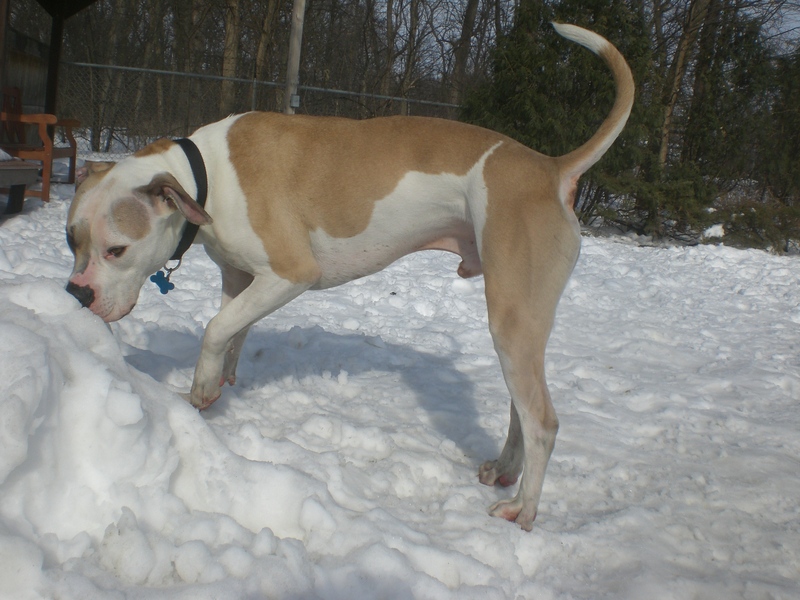 Posted by Meet the Pooches on February 12, 2015 in Dog Profiles and tagged adopt, animal shelter, animals, Chicago, dogs, Labrador Retriever, Orphans of the Storm, pets, Staffordshire Bull Terrier, Valentine's Day. Very interesting stuff. its interesting that Cooper enjoyed a good scratch on the back and behind the ears Just like my dog. This is one of the real orphans of the storm.